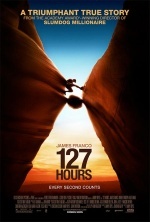 The strange auteurism of Danny Boyle--cosmopolitan, passionate, often stylistically and tonally awkward--is on full display in his new oddity, 127 Hours, a squirm-worthy stress-test with a Successories ethos and heedless, music-video aesthetic. Boyle's take on the remarkably story of mountain climber Aaron Ralston (James Franco) is at once cruelly straightforward and yet littered with eye-catching detritus. The celebrated self-amputee's ordeal is presented as a kind of stationary thriller, equally an obligatory celebration of the man's fortitude and also a blunt retort to the sort of American recklessness that cloaks itself in athlete-cowboy "self-sufficiency". Franco compels in what is essentially a one-man show, never more so than in the moment of absolute shock and horror when he first appraises his situation (and the title card finally appears, in a marvelous touch). Yet despite the raw, terrifying simplicity of the story, Boyle's method lacks discipline, and he almost immediately grows bored with Ralston's dusty surroundings. The director ornaments the film with every visual effect in his arsenal, with little consideration of whether it is warranted; he indulges in flashbacks, hallucinations, flamboyant POV shots, and more in order to expand the film's boundaries. A more rigorously constrained approach (as in Rodrigo Cortés' superior, fictional Buried) would have served Ralston's astonishing story better.